Homeshield is a reputable company and has been in business since 2001. Our products and workmanship come with up to a 15 year guarantee. Pressure sprayed by highly skilled technicians. Up to 20 times thicker than conventional paint. Eliminates penetrating damp while resisting dirt, mould, algae and acid rain. Will not chip, flake or peel. Remove ugly scars caused by window or door replacements. Weatherproof and microporous to allow the walls to breathe. Ideal for brick, stone, render, pebbledash and tyrolean, etc. We also offer a clear finish for brick and stone. 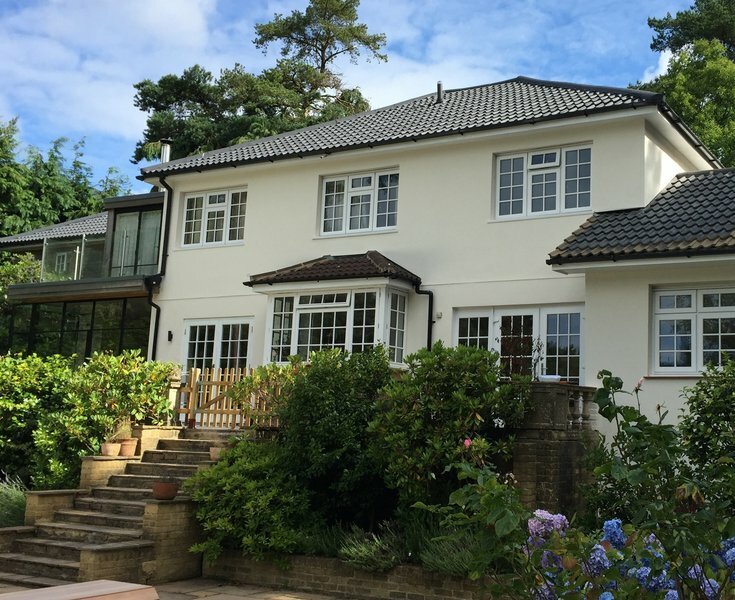 We provide an Insurance Backed Warranty from a leading FCA (Financial Conduct Authority) home improvements Warranty company (underwritten in the UK) and provide free deposit protection on all our wall coating work. The painted rear of our mid-terrace 1930s house had become shabby, cracked and peeling. Apart from the problems of finding a reliable workman any 'ordinary' repainting would inevitably need re-doing after a matter of years. When a flyer came with the post one day I was impressed with the photos of this apparently exceptional product, and further encouraged by the Which? accreditation. Every single contact with the staff of the company, has been a pleasure. The advice was sound and practical, with never any pressure to have 'extra' work done (some possible problems were declared not requiring remedial measures). Every aspect of the job was explained and discussed, and it was all duly executed on, or even before, the timetable. The guttering was adjusted, flaking paintwork scoured, cracked render reamed and replaced where necessary. Bearing in mind the forecast of they cracked on until the job was finished, rather than leave part to be done next day. The workmen were very pleasant but efficient and got on with their work - even the scaffolders were quiet. Rather than being in a hurry to finish 'just another job' they took pride in their work and showed us what they had done at each major stage. We subsequently had a slight problem with the gutter but the immediate response was 'we will fix that' and they did so. At every stage they exceeded our expectations. If only ALL work could be done like this. Dear Customer Thank you for your feedback it is very much appreciated will pass all comments on to the crew and office staff great to hear you were talked through all stages of work everything ran smoothly we do like to take pride in all of our work and we are happy that you are happy with the service received. Fabulous team and fabulous service! Having moved to our cottage in Carmarthenshire in October last year we were totally unaware that we had rising damp and an overall significant damp problem in the exterior walls of the entire cottage....until the mildew appeared in most of the rooms!! It was truly horrendous with the bedroom wall actually wet on the inside. In desperation we tried to look locally for help but miraculously a flyer appeared at the same time for Homeshield! I gave them a call and from start to finish we were met with efficiency, professionalism and an impeccable service. There was no pushy salesman and we were given the full facts and information and time to consider although we knew immediately we trusted this company and booked the work. We were kept fully informed as to the process and timescales and it was started as soon as the weather allowed. Before this however the work was meticulously planned and this was shared with us so we knew what was entailed. The Dampproofing was carried out first by a fantastic team and this was followed by an equally fantastic and efficient team who carried out the work on the walls. We had to have scaffolding erected and even this was planned to the day and removed promptly after the work was completed. The work is now complete and we are thrilled. The cottage looks great but more importantly we are confident that the walls can now begin the drying out process and we are already seeing a difference. Thank you so much Homeshield!! Dear Customer Thank you for your great feedback it is very much appreciated glad to hear you were happy with the service received and the end result we like to keep everyone informed as much as possible and is great to know that our processes are working all comments will be passed on to all parties. I had the back and front of my property rendered - however there where issues with the structure of my property. This company went over and beyond helping to sort these out. They had to do a full repair in the end which meant taking it down and starting from scratch. The finished product is absolutely stunning and we have noticed a marked difference in the temperature in the house. I was kept informed of what was happening and all of the details were taken care of so I had no stress or anything I had to do. The teams of people who did the job were extremely professional and kept to all of their time agreements. I would absolutely recommend them as a company. Dear Sarah Thank you for your review it is very much appreciated great to hear you were kept updated and are happy with the end result all feedback is passed on to our crews and office staff and happy that even the temperature of your house has improved. Dear Triggles Thank you for your feedback it is much appreciated good to hear you are happy with the work and our crew. Job: Protective coating added to exterior walls after repairs carried out. Needs to be more information upfront about scaffolding positioning & effect on TV service (no service during job), and neighbour's garden. Also access to water & electricity needs to be explained upfront. Each day tap in garage not turned off, so came home to wet garage floor. On completion of job, property left in total mess. Old paint flakes surrounded the house, were in my garden, on the community courtyard & neighbour's garden. Weeks later after job finished, still sweeping them away. Paint on brickwork where the masking tape had been applied. Paint on my path and on community courtyard block paving. Garden light broken; apologised but not acceptable. Lack of respect shown for customer's property. This was an expensive piece of work and I am so disappointed, stressed and upset with the way this work was carried out. I would not recommend this trader. We are very sorry to hear of your dissatisfaction, as you will see from other reviews on our Which? profile page this is far from the standard service and customer satisfaction levels we deliver week in week out across the UK. We nonetheless value all feedback, only through such feedback can we continually improve. On receipt of your review on Friday we tried to contact you (messages were left) and a Director visited your property to investigate your concerns the very next working day (Monday). Whilst the quality of all our repair work and coating application are not criticised, the lack of information regarding housekeeping matters such as provision of water/electricity etc. caused aggravation, this stems from the fact we did not manage to arrange a mutually convenient time to carry out the pre-work survey when we discuss these facts, we also discuss these at point of sale and include it in our t’s & c’s. We apologise for the flakes of old paint left on the ground post pressure washing and will send a team back to clean up any remaining flakes. On comparison with our pre-installation photographs we can confirm that the paint on the brickwork you mention was there before we started. We also have spoken with our foreman and are aware his offer to refund the cost of the small solar light was rejected and confirm that your tap was not left on but leaked. We hope to speak as soon as you are available and offer our sincere apologies for any inconvenience that may have been caused. From the initial first contact of the salesguy to the final receipt of their 15 years' guarantee, I found all Homeshield staff to be totally professional, kept me informed at all times, friendly and respectful. Above all they more than delivered what they promised. They cleaned down our 1960s detached bungalow, restored and repaired all our walls, creating bellcasts over the windows and beading for sharp edges and renovated our front porch. They then worked extremely hard to spray the beautiful textured finish and complete the works before we went on holiday. Amazing. Dear Katy many thanks for taking the time to let us know your thoughts on your experience with Homeshield and the actual work processes we carried out on your home. As you know we treat each home differently depending on the specifics of the property and what improvements customers would like to make, thanks again. I cannot praise the workmanship and quality of finish enough. Meticulous in every detail, the team headed by Simon are a credit to HSC. Looks brilliant! Thank you. Dear Brian, thank you for taking the time to let us know your thoughts on our service, we are obviously pleased that you are very satisfied with the quality of our work and our attention to detail. I will speak with Simon personally to pass on your comments, thank you. Good job overall but spray team could be tidier and carry out minor details better. All men prompt and very courteous and professional. Dear Annette, thank you for your comments, Homeshield always looks at all customer feedback to assess what could done better to continually improve the service we offer. Whilst we are pleased that you are satisfied with the works overall and the professionalism of our operatives, as you are aware we will be assessing the "minor details" you mention and taking action to insure you are completely satisfied, many thanks. We had a problem wall (flint embedded in lime mortar) this wall was suffering from penetrating and rising damp. The men stabilised areas that required it, inserted a new damp course, primed and then coated the wall. They worked carefully and methodically, referring by photograph back to their surveyor as necessary. I can't rate them too highly and the wall looks very good and we are now waiting for it to dry out. They left no mess. Came and completed the works required. The company has always been extremely helpful and a credit to the industry.